48 www.coalage.com April 2018 legally speaking A Year Into Trump's Presidency, Has He Made Good on His Promise? by megan caldwell A little more than a year into President Donald Trump's presidency, the dra- matic coal revival promised seems to be little more than an empty campaign promise yet to be realized. President Trump and his administration have made substantial headway to undo en- vironmental regulations put in place by President Barack Obama, and a hand- ful, discussed below, directly impact the coal industry. Whether these efforts have significantly improved the trajec- tory of the coal sector, however, is ques- tionable at best. • Trump signed legislation ending the Stream Protection Rule, an Obama- era regulation that prevented the dumping of coal mining waste into streams and waterways by clarify- ing vague wording in the 1977 Sur- face Mining Control and Reclama- tion Act. The rule, which was geared toward reducing the impacts of mountaintop mining, would have required mining companies to re- store streams and return mined ar- eas to the uses they were capable of supporting prior to the mining ac- tivities. It would have also required those companies to replant impact- ed areas with native trees and veg- etation and test and monitor the conditions of streams that might be affected by mining activities. The reduced obligations will arguably save mining companies money, al- though it is unclear whether these savings will ultimately translate into any increased coal production. • An executive order that ordered a review of all actions that could hin- der the development and exploita- tion of energy resources. The order revoked a multitude of Obama-era efforts aimed at climate change. In compliance with that executive order, Environmental Protection Agency (EPA) Administrator Scott Pruitt announced he would repeal the Clean Power Plan (CPP), which focused on reducing emissions from coal-burning power plants, increas- ing the use of renewable energy, and energy conservation. 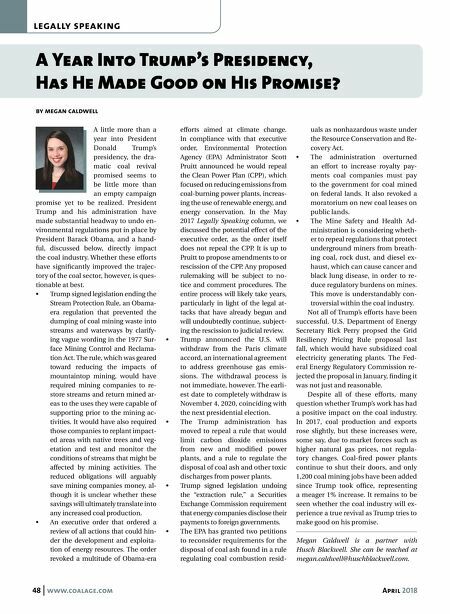 In the May 2017 Legally Speaking column, we discussed the potential effect of the executive order, as the order itself does not repeal the CPP. It is up to Pruitt to propose amendments to or rescission of the CPP. Any proposed rulemaking will be subject to no- tice and comment procedures. The entire process will likely take years, particularly in light of the legal at- tacks that have already begun and will undoubtedly continue, subject- ing the rescission to judicial review. • Trump announced the U.S. will withdraw from the Paris climate accord, an international agreement to address greenhouse gas emis- sions. The withdrawal process is not immediate, however. The earli- est date to completely withdraw is November 4, 2020, coinciding with the next presidential election. • The Trump administration has moved to repeal a rule that would limit carbon dioxide emissions from new and modified power plants, and a rule to regulate the disposal of coal ash and other toxic discharges from power plants. • Trump signed legislation undoing the "extraction rule," a Securities Exchange Commission requirement that energy companies disclose their payments to foreign governments. • The EPA has granted two petitions to reconsider requirements for the disposal of coal ash found in a rule regulating coal combustion resid- uals as nonhazardous waste under the Resource Conservation and Re- covery Act. • The administration overturned an effort to increase royalty pay- ments coal companies must pay to the government for coal mined on federal lands. It also revoked a moratorium on new coal leases on public lands. 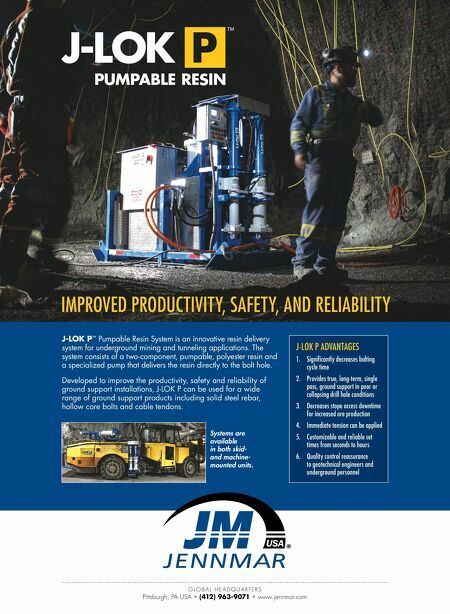 • The Mine Safety and Health Ad- ministration is considering wheth- er to repeal regulations that protect underground miners from breath- ing coal, rock dust, and diesel ex- haust, which can cause cancer and black lung disease, in order to re- duce regulatory burdens on mines. This move is understandably con- troversial within the coal industry. Not all of Trump's efforts have been successful. U.S. Department of Energy Secretary Rick Perry propsed the Grid Resiliency Pricing Rule proposal last fall, which would have subsidized coal electricity generating plants. The Fed- eral Energy Regulatory Commission re- jected the proposal in January, finding it was not just and reasonable. Despite all of these efforts, many question whether Trump's work has had a positive impact on the coal industry. In 2017, coal production and exports rose slightly, but these increases were, some say, due to market forces such as higher natural gas prices, not regula- tory changes. Coal-fired power plants continue to shut their doors, and only 1,200 coal mining jobs have been added since Trump took office, representing a meager 1% increase. It remains to be seen whether the coal industry will ex- perience a true revival as Trump tries to make good on his promise. Megan Caldwell is a partner with Husch Blackwell. She can be reached at megan.caldwell@huschblackwell.com.